Heat the oil in a large heavy-based frying pan over medium-high heat. Season pork. Cook, turning, for 3 minutes or until browned. Transfer to a plate. Add onion and garlic and cook, stirring, for 3 minutes or until softened. Add fennel and cook, stirring, for 1 minute. Add tomato. Cook, stirring, for 1 minute. Add wine. Simmer for 2 minutes or until reduced by half. Stir in stock and mustard. Simmer for 5 minutes. Stir in lentils. Return pork to the pan. Cook, turning pork halfway, for 6 minutes or until cooked through. Stir in 1 tbs lemon juice and season. Combine the parsley, olives and remaining lemon juice in a bowl. 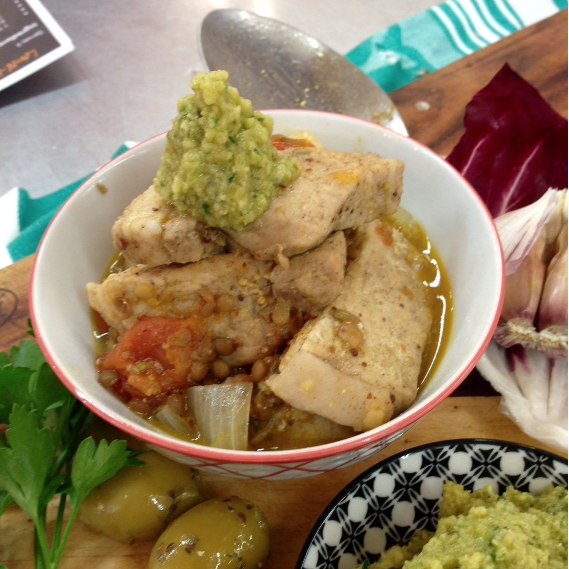 Serve pork topped with olive relish. This meal is great with a leafy side salad.